In a tumble-down Memphis hotel run by rock ‘n roll royal Screamin’ Jay Hawkins (with bellboy Cinqué Lee, brother of Spike Lee, in tow) three stories unfold: a pair of Elvis-obsessed Japanese tourists make the rounds of the King’s hometown, a woman stranded en route to Italy is met by an apparition, and a greaser (played by Joe Strummer) goes an all-night bender that turns perilous. “A meditation on nighttime and transience, on rhythm-and-blues and the city of Memphis, that comes camouflaged as a deck of three stories. Like its predecessors, it mixes high and low comedy, sadness and high jinks, and extracts a subtle, limpid beauty from the rawest of materials”—Luc Sante. 1989, 110 minutes, color, 35mm | Written and directed by Jim Jarmusch; with Masatoshi Nagase, Youki Kudoh, Screamin' Jay Hawkins, Joe Strummer, Steve Buscemi and Cinqué Lee. 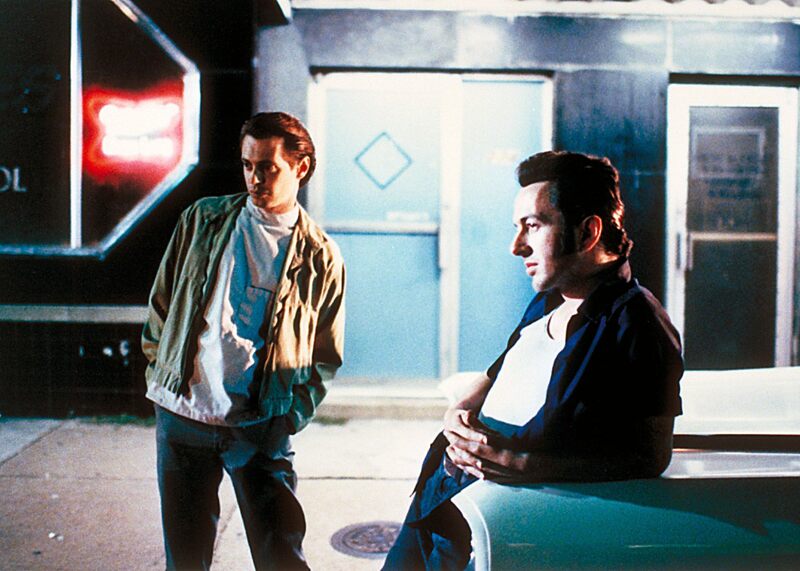 Steve Buscemi and Joe Strummer in Mystery Train (1989).